This document presents an ontology called Web Service Modeling Ontology (WSMO) for describing various aspects related to Semantic Web Service. Having the Web Service Modeling Framework (WSMF) [Fensel & Bussler, 2002] as a starting point, we refine this framework and develop a formal ontology and a formal language. The WSMF [Fensel & Bussler, 2002] consists of four different main elements: ontologies that provide the terminology used by other elements, goal repositories that define the problems that should be solved by web services, web services descriptions that define various aspects of a web service and mediators which bypass interoperability problem. Section 2 presents the principles and the approach for WSMO. Section 3 presents the non functional properties (core properties) of each modelling element of WSMO. Following the philosophy of WSMF, we further refine in the next sections the ontologies (Section 4), goals (Section 5), mediators (Section 6) and web service (Section 7). Section 8 presents the formal language we use for specifying WSMO and Section 9 presents our conclusions and further intentions. While there are many existing efforts trying to define Web Services as well as Semantic Web Services like OWL-S, BPEL4WS and so on, none of them explicitly states its underlying principles and approaches. Furthermore, none of the approaches follows through from the conceptualization all the way to a formal execution model backed up by an open source implementation. The WSMO addresses all these deficiencies and is therefore a solution of a different quality, representing the first effort ever addressing the domain of Semantic Web Services completely. Every ontology design is based on principles of the domain that is going to be formally represented. In the following the principles of the WSMO are outlined that guide the ontology design decisions. Interface vs. Implementation. When formally describing interacting entities then it is important to recognize the difference between the interface of an interacting entity, its internal implementation as well as its externally visible and internal behavior. The WSMO shall make this distinction to be always very specific on when describing external interfaces and external behavior versus internal implementations and internal behavior. Peer-to-peer vs. Client/Server. Interacting entities, sometimes called agents, are characterized in general by one entity interacting with one or more other entities. In the simplest case, two entities are interacting. In the context of Semantic Web Services, the interaction is between equal partners, i.e., one entity sending a message and the other one receiving the message are equal in their level of control over the other entity. This is called a peer-to-peer approach in contrast to a client/server approach where the client drives the interaction as the controlling entity. The WSMO shall recognize the fact that all entities are equal in their control structure leading in the general case to conversations amongst equal partners. Type and instance. Semantic Web Services are defined at design time and executed at runtime. This implies a distinction between the general description of a Semantic Web Service and its instantiation. One defined Semantic Web Service can be executed many times, concurrently as well as sequentially. In general, not every concept in the domain follows that general principle. For example, there is only one instance of a specific person, not a type. Hence, the instance of a person has to be described with WSMO, not its type (while of course a concept of person is an agent). The WSMO shall be diligent in making this distinction in order to allow a real representation of the domain of Semantic Web Services. In addition to principles that are underlying the domain of representation, ontologies have a purpose and are used in a specific context. The WSMO is not only describing the domain of Semantic Web Services, but also serves as the conceptual model for a formal language design as well as an execution environment for the actual execution of Semantic Web Service interactions. Execution completeness. The WSMO is the underlying conceptual model for defining and executing Semantic Web Services. Therefore, the WSMO shall be complete so that actual Semantic Web Services can not only be defined but the definition is complete for execution purposes. Execution property completeness. Semantic Web Services are not a passive data representation but the description of the interaction or conversation patterns of interacting agents. Properties have to be ensured to support the flawless execution of conversations. This includes deadlock freedom, livelock freedom, reachability of permitted and consistent end states, interoperability as well as correct compensation amongst others. The WSMO shall be designed in such a way that the mentioned properties can be ensured statically before runtime. Execution semantics. The WSMO is a representation of the domain of Semantic Web Services. Since it formally describes the interactions of agents a formal execution semantics has to be defined in order to uniquely specify the execution behavior at runtime. The concepts of WSMO shall have a formal execution semantics to ensure a consistent execution model. While it is possible and tempting to design one big, all encompassing WSMO, this is not followed due to its inherent complexity and difficulty to comprehend. 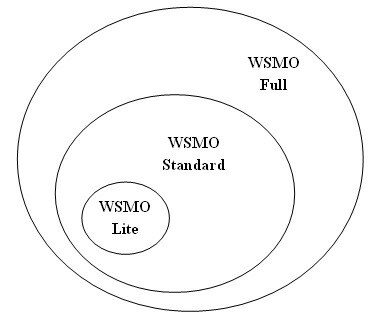 Instead, a layered approach is followed that starts with a basic WSMO, called WSMO-Lite, continues with a mature set of concepts called WSMO-Standard and ends with a full ontology called WSMO-Full. As Figure 2 shows, the different variants of WSMO include each other, one building on top of the other. A name given to the element. Typically, title will be a name by which the element is formally known. An entity primarily responsible for making the content of the element. Examples of creator include a person, an organization, or a service. Typically, the name of a creator should be used to indicate the entity. A topic of the content of the element. Typically, subject will be expressed as keywords, key phrases or classification codes that describe a topic of the element. Recommended best practice is to select a value from a controlled vocabulary or formal classification scheme. An account of the content of the element. Examples of description include, but is not limited to: an abstract, table of contents, reference to a graphical representation of content or a free-text account of the content. An entity responsible for making the element available. Examples of publisher include a person, an organization, or a service. Typically, the name of a publisher should be used to indicate the entity. An entity responsible for making contributions to the content of the element. Examples of contributor include a person, an organization, or a service. Typically, the name of a contributor should be used to indicate the entity. A date of an event in the lifecycle of the element. Typically, date will be associated with the creation or availability of the element. The nature or genre of the content of the element. Type includes terms describing general categories, functions, genres, or aggregation levels for content. The physical or digital manifestation of the element. Typically, format may include the media-type or dimensions of the element. Format may be used to identify the software, hardware, or other equipment needed to display or operate the element. Examples of dimensions include size and duration. An unambiguous reference to the element within a given context. Recommended best practice is to identify the element by means of a string or number conforming to a formal identification system. Formal identification systems include but are not limited to the Uniform element Identifier (URI) (including the Uniform element Locator (URL)), the Digital Object Identifier (DOI) and the International Standard Book Number (ISBN). A reference to a element from which the present element is derived. The present element may be derived from the source element in whole or in part. Recommended best practice is to identify the referenced element by means of a string or number conforming to a formal identification system. The extent or scope of the content of the element. Typically, coverage will include spatial location (a place name or geographic coordinates), temporal period (a period label, date, or date range) or jurisdiction (such as a named administrative entity). Information about rights held in and over the element. Typically, rights will contain a rights management statement for the element, or reference a service providing such information. Rights information often encompasses Intellectual Property Rights (IPR), Copyright, and various Property Rights. If the Rights element is absent, no assumptions may be made about any rights held in or over the element. Ontologies define formal semantics for information, consequently allowing information processing by a computer. Ontologies define real-world semantics which make it possible to link machine-processable content with meaning for humans based on consensual terminologies. From this rather conceptual definition we want to extract the essential components which define an ontology. Eventually, we aim at representing ontologies no matter what ontology language is being used for describing them. Ontologies define a consensual terminology by providing concepts and relationships among the set of concepts. In order to capture semantic properties of relations and concepts, an ontology generally also provides a set of axioms, that means expressions in some logical framework, for instance First-Order Logic. Each element that belongs to the established terminology, i.e. concepts and relations, can be further constrained semantically by means of a logical constraint that expresses some sort of real-world semantics related to this element. Eventually, there might also be individuals included within an ontology that represent instances of concepts. There are several ways to describe the contents of ontologies by an ontology  itself. For now, we decide to keep the model as simple as possible and represent each element of an ontology as simple as possible. The non functional properties of an ontology consist of the core properties described in Section 3. Building an ontology for some particular problem domain can be a rather cumbersome and complex task. One standard way to deal with the complexity is modularization. Imported ontologies allow a modular approach for ontology design. By importing other ontologies, one can make use of concepts and relations defined elsewhere. Nevertheless, when importing an arbitrary ontology, most likely some steps for aligning, merging and transforming imported ontologies have to be performed. For this reason and in line with the basic design principles underlying the WSMF, we use ontology mediators (ooMediators) for importing ontologies. The set of concepts that belong to the represented ontology. The set of relations that belong to the represented ontology. The set of axioms that belong to the represented ontology. The set of instances that belong to the represented ontology. Concepts constitute the basic elements of the consensual terminology for some problem domain. They provide an abstract view on real-existing and artificial artifacts within the addressed domain of discourse. From a high-level perspective a concept – described by a concept definition – provides attributes with names and types. It has a name, can be textually described in natural language and might change over time and thus has a version (they are part of the non functional properties af the concept). Furthermore, a concept can have several (possibly none) direct superconcepts as specified by the so-called "is_a"-relation. When describing the semantics of concepts within some ontology, we favor an uniform and rather general approach: we consider the semantics to be captured by means of a logical expression. For instance, this allows us to state that some concept represents the union or intersection of two or more other concepts. Consider an ontology on social structures within a human society, then we can defined concepts like “Human-being” or “Female” and accurately describe the semantics of the concept “Granny” as precisely the intersection of the concepts “Human-being”, “Female” and “Parent of some parent”. Such modeling styles are commonly used in many Description Logics [Baader et al., 2003] and can be found in widely-used ontology languages like OWL [McGuinness & van Harmelen, 2003] as well. There can be a finite number of concepts that serve as direct superconcepts for some concept. In particular, being a subconcept of some other concept means that a concept inherits the signature of this superconcept and the corresponding constraints. Each concept provides a (possibly empty) set of attributes that represent named slots for data values and instances that have to be filled at the instance level. An attribute definition specifies a slot of a concept by fixing the name of the slot as well as a logical constraint on the possible values filling that slot. Hence, this logical expression can be interpreted as a typing constraint. The non functional properties of an attribute definition consist of the core properties described in Section 3. A logical expression constraining the possible values for filling the slot of any instance of a particular concept. Besides attributes we also allow a concept to have methods  that can be invoked on each instance of a concept and in response return some result value. A method definition specifies a function that can be invoked on a specific instance of a concept. When invoking the function, one has to specify the values of the parameters, for which the function has to be computed. The specific instance for which the method is invoked, can be seen as an implicit input parameter of the function, that is not explicitly contained in the set of input parameters. The computed value will then be returned to the invoker. The non functional properties of a method definition consist of the core properties described in Section 3. A list of the input parameters of the method. Concrete values for these parameters have to be specified when the method will be invoked. A parameter is a named placeholder for some value. This concept is used in the definition of methods as well as in the definition of n-ary relations. The non functional properties of a parameter consist of the core properties described in Section 3. A logical expression constraining the possible values that the parameter can take. The second main building block for the specification of an ontology are relations. Relations are used in order to model interdependencies between several concepts (respectively instances of these concepts) with respect to the problem domain. Relations between concepts are more general than simple attributes or properties as for instance in OWL. Mathematically, relationships are simply sets of n-tuples, over the domain of instances of concepts. In popular and commonly used system modeling languages like UML [Fowler, 2003] such concrete tuples are often called links. The underlying semantics of cardinalities in the case of n-ary relations follows the definition in the UML framework [Rumbaugh et al., 1998]. Relations can be very specific in nature and only applicable in the context of a particular problem domain, but there are also relations that occur frequently when modeling ontologies for different application areas. There are several common properties that modeled relations can provide, e.g. symmetry, transitivity, reflexivity. Again, for the sake of simplicity we decide not to represent these common properties of relationships currently within the metaontology explicitly but implicitly by means of axioms. Other dependencies between relationships (for instance subset, intersection, union, difference, inverse relationship between two or more relations) will be dealt with in the same way. The non functional properties of a relation definition consist of the core properties described in Section 3. A list of parameter descriptions specifying each of the concepts that are interrelated. An axiom is considered to be a logical expression enriched by some extra-logical information. The non functional properties of an axiom definition consist of the core properties described in Section 3. The logical constraint expressed in the formal language underlying the WSMO that represents the actual statement of the axiom. Eventually, within an ontology there might be instances defined for some concept. Therefore we have to reflect the “instance_of”-relation that can be given within an ontology specification. The non functional properties of an instance consist of the core properties described in Section 3. We consider the general case, where an instance might be the instance of some (complex) concept which is defined in terms of a logical expression. A list of attribute values for the instance. The non functional properties of an attribute value definition consist of the core properties described in Section 3. A logical expression defining the values for filling the slot of the instance. In this section, we introduce the notion of goals and define the elements that are used in the description of a goal. Our definition of a goal is the one given in [Fensel & Bussler, 2002]: A goal specifies the objectives that a client may have when he consults a web service. WSMO restricts the definition of goals to Post-conditions. In addition, the Web Services Modeling Ontology introduces non-functional properties, used mediators, and effects. The non functional properties of a goal consist of the core properties described in the Section 3 (where, in this case, an element in the core properties is equivalent to a goal). By importing ontologies, a goal can make use of concepts and relations defined elsewhere. 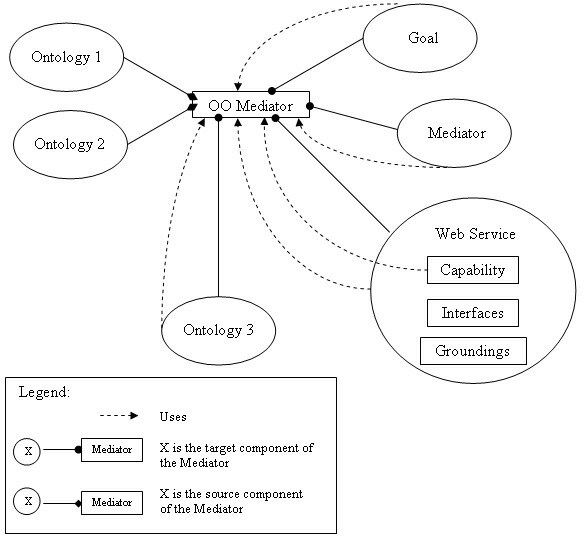 A goal can import ontologies using ontology mediators (ooMediators). A goal may be defined by reusing an already existing goal (e.g. for defining the goal “buy a book for children” one can reuse the already existing goal “buy a book”) or by combining existing goals (e.g. for defining the goal “buy a book from Amazon written by Hemingway” one can reuse and combine the existing goals “buy a book from Amazon” and “buy a book written by Hemingway”). This is achieved by using goal mediators (ggMediators). Post-conditions in WSMO describe the state of the information space that is desired. Effects describe the state of the world that is desired. In this section, we introduce the notion of mediators and define the elements that are used in the description of a mediator. ggMediators: mediators that link two goals. ooMediators: mediators that import ontologies and resolve possible representation mismatches among all imported ontologies. wgMediators: mediators that link web service to goals. They explicitly may state the difference (reduction) between the two components and map different vocabularies. wwMediators: mediators linking two Web Services. The non functional properties of a mediator consist of the core properties described in the Section 3 (where, in this case, an element in the core properties is equivalent to a mediator). Besides these properties, and taking into account that a mediator uses a mediation service, the non functional properties of a mediator also include aspects related to the quality aspect of the mediation service (see next section for a description of these properties). The quality aspects of the mediator and the mediation service, taken together, might be enhanced (e.g. improving the robustness) or weaken (e.g. increasing the response time) by the mediator. The source component defines one of the two logically connected entities. The target component defines one of the two logically connected entities. The mediation service points to a goal that declarative describes the mapping or to a wwMediator that links to a web service that actually implements the mapping. A reduction only exists in a wgMediator or a ggMediator. It describes in a logical formula the differences between the functionality described in the goal and the one of the web service (if any) or another goal. For an example of how the mediators are used, refer to the Appendix. In this section we identify the concepts needed for describing various aspects of a web service. From a complexity point of view of the description of a web service, the following properties of a web service are considered: non functional properties, used mediators, capability, interfaces and groundings. The non functional properties of a web service are described in Section 7.1. By importing ontologies, a web service can make use of concepts and relations defined elsewhere. 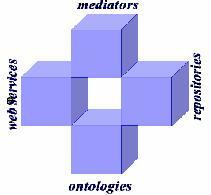 A web service can import ontologies using ontology mediators (ooMediators). The capability of a web service is described in Section 7.2. The interfaces of a web service are described in Section 7.3. The groundings of a web service are described in Section 7.4. It represents how fast a service request can be completed. According to [Rajesh & Arulazi, 2003] performance can be measured in terms of throughput, latency, execution time, and transaction time. The response time of a service can also be a measure of the performance. High quality web services should provide higher throughput, lower latency, lower execution time, faster transaction time and faster response time. It represents the ability of a web service to perform its functions (to maintain its service quality). It can be measured by the number of failures of the service in a certain time internal. It represents the ability of a service to provide authentication (entities - users or other services - who can access service and data should be authenticated), authorization (entities should be authorized so that they only can access the protected services), confidentiality (data should be treated properly so that only authorized entities can access or modify the data), traceability/auditability (it should be possible to trace the history of a service when a request was serviced), data encryption (data should be encrypted), and non-repudiation (an entity cannot deny requesting a service or data after the fact). It represents the error rate generated by the web service. It can be measured by the numbers of errors generated in a certain time interval. It represents the transactional properties of the web service. It represents the trust worthiness of the service. It represents the cost-related properties of a web service. They represent the QoS mechanisms operating in the transport network which are rather independent of the web services. They can be measured by network delay, delay variation and/or message loss. A capability defines the web service by means of its functionality. The non functional properties of a capability consist of the core properties described in the Section 3 (where, in this case, an element in the core properties is equivalent to a capability). By importing ontologies, a capability can make use of concepts and relations defined elsewhere. 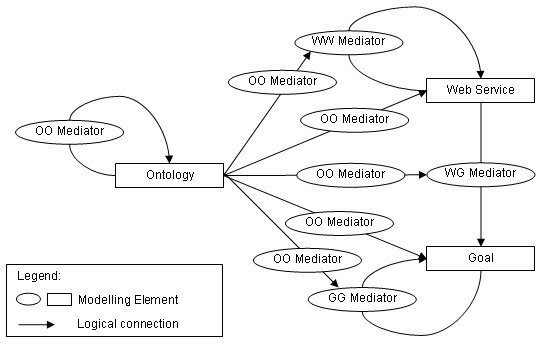 A capability can import ontologies using ontology mediators (ooMediators). A capability can be linked to a goal using a wgMediator. Pre-conditions in WSMO describe what a web service expects for enabling it to provide its service. They define conditions over the input. Post-conditions in WSMO describe what a web service returns in response to its input. They define the relation between the input and the output. Assumptions are similar to pre-conditions, however, also reference aspects of the state of the world beyond the actual input. Effects describe the state of the world after the execution of the service. The purpose of defining again pre-conditions, post-conditions, assumptions, effects, non-functional properties and used mediators in the service capability is to have self-contained web service descriptions, that can be referred or not to the defined goals. In this way, we provide greater flexibility for the use of goals and web services. The non functional properties of an interface consist of the core properties described in the Section 3 (where, in this case, an element in the core properties is equivalent to an interface). The service should be able to express error data: data indicating problems during the execution. This is represented in terms of error codes. We classify errors in domain-independent and domain dependent errors. The domain independent errors are similar to HTTP errors. The domain dependent errors are considered to be defined in ontologies (for example a service may return an error Invalid account number – a domain dependent error, described in a domain ontology). Orchestration defines the sequence and conditions under which multiple cooperating proxies exchange information in order to achieve some useful function. A proxy is defined as being either a goal or a wwMediator. Proxies are used when a web service invokes other web services in order to provide its service. Each time a web service needs to be invoked, a proxy needs to be declared (by either declaring a goal or linking it to a wwMediator). This way both dynamic (on the fly) composition (by declaring proxies consisting of goals descriptions) and static composition (by linking proxies to wwMediators) are supported. In addition, orchestration describes an access to the intermediate states of the service. Very related to orchestration are data and control flow – both implementing the external accessible part of the business logic of the web service. When an invoked service fails (i.e. an error code is returned), the service that invoked it may implement a strategy for compensation. The compensation in fact represents either a wwMediator or a goal. A message exchange pattern describes the temporal and causal relationships, if any, of multiple messages exchanged . From the conceptual point of view the grounding can link to various sorts of interface implementations, e.g. WSDL, CORBA, ebXML and others. The W3C defines web services as a software system offering and interface accessible over SOAP with machine processable interface description and especially mentions WSDL. Since the presented ontology is aiming at describing web services it is reasonable to choose the current standard for such a description which is WSDL 2.0, a specification language proposal, with strong industry backing. One error message generated by the service through it's interface is translated to a fault message in WSDL and a message exchange in the interface corresponds to a combination of WSDL message exchange patterns. As shown in the previous sections, many properties of goals, mediators, ontologies and web services are considered to be axioms, defined by logical expressions. In order to be as specific as possible, we consider these logical expressions as being described in F-Logic [Kifer et al., 1995], by complex formulas. F-Logic combines the advantages of conceptual high-level approaches typical for frame-based language and the expressiveness, the compact syntax, and the well defined semantics from logics. Features of F-Logic include: object identity, methods, classes, signatures, inheritance and rules. For a detailed description of F-Logic refer to [Kifer et al., 1995]. Furthermore, an evaluation of F-Logic and comparison to other languages is given in [Keller et al., to appear]. This document presented the Web Service Modeling Ontology (WSMO) for describing several aspects related to web services, by refining the Web Service Modeling Framework (WSMF). Further versions of this document will contain more detailed descriptions of some concepts presented here as well as refinements that add concepts to the current ontology. WSMO is centered around the underlying technology to be described. The next step is to define a layer on top in terms of the application that is supported by it: fully flexible eCommerce and eWork. [Gruber, 1993] T. Gruber: A translation approach to portable ontology specifications,Knowlegde Acquisition, 5:199-220, 1993. [Keller et al., to appear] U. Keller, A. Polleres, R. Lara, and Y. Ding: Language Evaluation and Comparison, to appear. [Kifer et al., 1995] M. Kifer, G. Lausen, and James Wu: Logical foundations of object oriented and frame-based languages. Journal of the ACM, 42(4):741-843, 1995. [McGuinness & van Harmelen, 2003] D. L. McGuinness and F. van Harmelen: OWL Web Ontology Language Overview, W3C Proposed Recommendation, 15 December 2003. Latest version is available at http://www.w3.org/TR/owl-features/. The work is funded by the European Commission under the projects DIP, Knowledge Web, Ontoweb, SEKT, SWWS, Esperonto, COG and h-TechSight; by Science Foundation Ireland under the DERI-Lion project; and by the Vienna city government under the CoOperate project. In the figure 4 below an example of how ggMediators, wgMediators and wwMediators are used is given. Goal1 uses a ggMediator to connect to (e.g. import) Goal2. The source component of the ggMediator becomes Goal2 and the target component becomes Goal1. 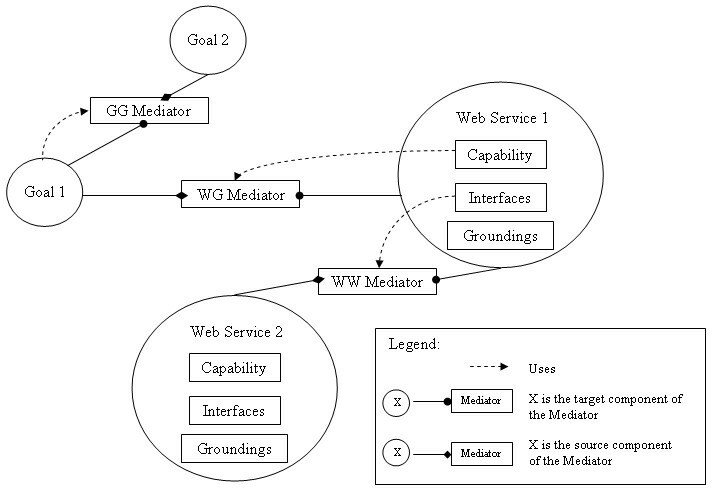 The capability of the Web Service 1 uses a wgMediator to connect to Goal1. The source component of the wgMediator becomes Goal1 and the target component becomes Web Service 1. Figure 4. An example of how ggMediator, wgMediator and wwMediator are used. An interface of the Web Service 1 uses a wwMediator to connect to (e.g. invoke) Web Service 2. The source component of the wwMediator becomes Web Service 2 and the target component becomes Web Service 1. (Note: for the simplicity of the figure we did not consider chains of mediators of the same type). In the figure 5 below an example of how ooMediators are used is given. Ontology 3 imports Ontology 1 and Ontology 2 by using the ooMediator. The source components of the ooMediator become Ontology 1 and Ontology 2 and the target component Ontology 3. A Goal imports Ontology 1 and Ontology 2 by using the ooMediator. The source components of the ooMediator become Ontology 1 and Ontology 2 and the target component the Goal. Figure 5. An example of how ooMediator is used. A Mediator (ggMediator, wgMediator, wwMediator or ooMediator) imports Ontology 1 and Ontology 2 by using the ooMediator. The source components of the ooMediator become Ontology 1 and Ontology 2 and the target component the Mediator. A Web Service imports Ontology 1 and Ontology 2 by using the ooMediator. The source components of the ooMediator become Ontology 1 and Ontology 2 and the target component the Web Service. The capability of a Web Service imports Ontology 1 and Ontology 2 by using the ooMediator. The source components of the ooMediator become Ontology 1 and Ontology 2 and the target component the Web Service. Notice that WMSO is based on F-Logic, therefore, not only instances but also concepts and variables can be bound to variables. Therefore it does not suffer from artificial modelling constraints of other languages that often require to model concepts by instances in order to refer to them via variables. Such an ontology actually represents a metaontology. The notation used for defining the elements of WSMO is based on F-Logic syntax. It’s obvious, that this additional modeling element for describing ontologies only makes sense, if the logical framework underlying WSMO allows one to define and use methods within axioms. Since WSMO is principly based on F-Logic, this is clearly the case. Quoted from Web Service Architecture, W3C Working Draft 8 August 2003. Notice that the capability of this web service will also provide a declarative description of this mapping, however, in addition a link to an implementation of the mapping is provided, too.